“Very rarely do you meet a client who can actually end up being more fun to work with than agency folks! Theng Kiat’s trust is earned by doing good work. But once you’ve earned it, you will have an absolute team player. It becomes a partnership of equality and mutual respect … he’s also a client’s dream CMO,” a recommendation on his LinkedIn profile reads. After having met Goh Theng Kiat, chief marketing officer for global consumer financial services at OCBC, on a few occasions, I can see why the recommendation reads the way it reads. As we prepare for the photo shoot and the interview at the studio, Goh walks in and his unassuming personality is unmissable. It comes naturally to him to make those around him comfortable, to relate to everyone and be a part of any creative process – this time it was the photo shoot for the cover. His enthusiasm and preparedness for the shoot, much like his congeniality, were also unmissable. He brings the same enthusiasm and spirit of collaboration to his work. The guardianship of understanding consumers should be with marketing. Marketing should be able to lead the discovery of insights around consumers, and make the process of dissemination of these insights smooth and hassle-free for other departments. Marketing is often considered synonymous with creativity and ideas, but the one thing which is even more important than those two is discipline, he believes. “Discipline is what helps in bringing about consistency when it comes to building brands,” he says. And this is something marketers tend to forget often. Managing a brand is a long-term process, and what you do with your brand and how you take it forward, therefore, requires much more discipline than marketers currently have. “All the past stints I have done, whether it was to market shampoos and diapers to an extremely regulated product such as tobacco, I have found discipline to be a critical factor,” he says, adding it was more so for the case when he was marketing tobacco – a product for which marketing is highly regulated, globally. The limited avenues that brands can use make marketing tobacco very tricky. He had to be careful about what the brand said about the product and where, yet achieve great results with all the limitations. “That kind of discipline will always remain with me,” he says, and this matters in today’s world, where similar limitations exist – maybe not enforced by the law, but a result of the fragmented media consumption and waning attention spans of consumers. “Consumers now have the ability to choose where to receive information and what information to receive. Media fragmentation is a reality. We need to ensure we have the resources to optimise reach with a highly effective message for consumers to take note,” he says. This was not the case a few years ago when Goh started his career in marketing; when marketing was a one-way conversation with consumers and a lot of the power of broadcasting the messages was dictated by the corporations. 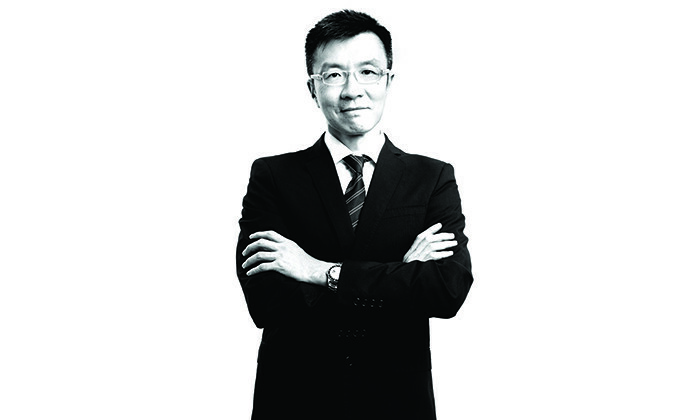 A tobacco marketer, a FMCG marketer and a lifestyle marketer all rolled into one, Goh is known among colleagues to be a strong problem solver and an inspirational leader, and regarded by friends as self-driven, focused and resourceful. He has worked for brands such as AkzoNobel Paints, Imperial Tobacco Group, British Tobacco and P&G, before joining OCBC two years ago. The diversity of his experience has played a crucial role in his career, Goh says, because what it has taught him is adaptability – certainly a marketer’s biggest strength in today’s times when change is occurring at an unprecedented pace. Another significant change that has happened over the years is the decentralisation of marketing. When Goh first started his marketing career, the responsibilities were centralised – it was the marketer’s job to understand consumers and look for insights. But now, with the explosion of data, and the need to offer differentiated customer experiences, specialists need to be brought in. “Marketing alone is not enough to do all of that,” he says. The need for collaboration is a lot more now. You need to work with specialists who are good in data, customer experience and design. And that’s where marketers need to let go of their territorial tendencies and collaborate. In his role, Goh works very closely with OCBC’s analytics, e-business and business transformation teams to understand all the services they are developing for the bank’s customers. The need for organisations to move away from silos, is therefore, a very real need and according to Goh, OCBC recognises the need to organise itself around its customers. “At this moment we know the importance of getting away from silos. The way we are organising, based on customer segments, is a step in that direction. This helps to define responsibilities in a new way wherein everyone embodies the culture of customer-first,” he says. OCBC has been quite forward-thinking in terms of marketing, according to Goh, entrusting the department to be the engine that identifies possibilities. And to do so, the CMO needs to have skin in the game and that was the emphasis when Goh first joined the bank. Therefore, on top of his CMO responsibilities, he also has a customer segment responsibility. While the move to becoming is a constant focus for the brand, it started to take more and concrete steps a few years ago. Earlier this year, the bank set up a new financial technology (fintech) unit called “The Open Vault at OCBC” to drive the ideation, prototyping and deployment of new technologies, innovative commercial business models and solutions to bring to market relevant financial products and services, and to enhance banking processes. The setting up of OCBC Bank’s fintech unit and The Open Vault at OCBC innovation lab is a step towards realising the Singapore government’s Smart Nation Programme and Monetary Authority of Singapore’s (MAS) vision to create a Smart Financial Centre in Singapore. Along the same lines, it later became the first bank in the region to launch an open application programming interface (API) platform that allows developers to integrate the bank’s products and services when building applications and programmes. OCBC Bank’s developer portal Connect2OCBC provides free access to four open-source APIs: The branch locator, ATM locator, smart card advisor and foreign exchange APIs, which it says will help the bank extend its reach to existing as well as potential customers “while creating a better user experience”. Such a big move means a few things for marketing. Goh says it is about communicating the good this will bring about, while assuring customers their data and assets they have trusted the bank with remain secure. “Within the financial information we are careful about how much information we can reveal. What we are opening up now is not customer centric-information, but information about branches and ATMs,” he says. The precedence of opening up APIs is encouraging. Citing examples of companies such as Uber, Goh says it has helped them to grow into other industries and tap newer opportunities. And what has been the one big learning in his first job as a bank’s marketer? “Before joining the industry, I looked at the external aspects of the job more, that is, all the consumer-facing things a brand did. The fun bits,” he says, adding now that he is inside, he can appreciate a lot more that goes on in the background before a brand can communicate to the audience. From yoga, gymnastics, skateboarding to basketball, the Japanese sportswear label wants to show customers it's more than a running..